Jason Brown and coach Kori Ade, right, forged a strong bond at a young age, with the encouragement and understanding of Jason's mother, Marla, left. At 5 years old, Jason Brown was not looking for a second mother, and at 26, Kori Ade was not sure she even wanted such a responsibility. "I remember saying, 'Ooh, maybe I shouldn't take over so much or be so involved,' " Ade said. Among the lessons the coach enforced with the future Olympic figure skating bronze medalist and others in her charge: chewing with mouths closed, keeping socks on, making eye contact with adults. 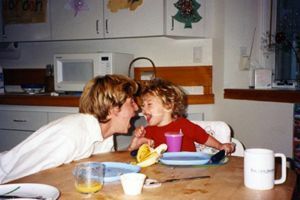 A young Jason Brown and his mother, Marla. "It's that whole village raising your child thing," Ade said. "Now that I have kids, I understand. Once you find the right village, you know your children are going to turn out OK."
The right village and the right parents. That Brown and his coach did not merely find each other but have stayed together for 15 years -- forging a relationship that Jason's mother, Marla, encouraged, Ade grew into and Jason thrived under -- is, they all say, remarkable and unique to their sport. It is also a Mother's Day tale worthy of both women. "To Jason," said his mother, "skating is Kori." "Marla," countered Ade, "is the perfect skating mom. She's involved in her role as the mom but she doesn't ever, ever step over the line." Still, that line can be a tricky one to negotiate, and the fact that they all survived those first few years may be the most remarkable of all. Their plan was modest at the start. "Skating was something to do. We certainly were not thinking about the Olympics," Marla Brown said of herself and her husband, Steven, parents to daughter Jordan, 21, Jason, 19, and son, Dylan, 16. "[Jason's] sister was taking lessons and I thought I'd kill two birds with one stone and have them go at the same time. "Kori was very young, not an experienced coach. And Jason was little and it just started as a fun activity like gymnastics and soccer." For the Browns, all that mattered at first was that Ade had a great "pied piper-type" personality to which their son was drawn. "Then we started valuing what she did for these kids," Marla said. "She was a holistic coach. When they were little, she taught them to look a person in the eye when you talk to them, to shake hands. From my perspective as a parent, I was just as impressed with how she was raising my child as a quality human being as much as teaching ice skating." Though rival coaches tried to break them up, Jason Brown and Kori Ade persevered. Their work has resulted in an Olympic medal. For Jason, it was an almost imperceptible progression from having a coach to having a second mom. "At first, she was this 26-year-old who I loved to work with," he said. "But it grew into someone who also taught me a ton about respect, and the more we worked with each other, Kori was definitely that mother figure away from my mom." Yet Brown was unthreatened by Ade's role in her son's life, so much so that they all laugh at the memory of a young Jason trying to negotiate bedtime and other rules at home by suggesting, "Let's call Kori and ask her." "Marla embraced it and figured out where the relationship's place was and allowed Jason to get close to me," Ade said. "If Marla hadn't given me that title in Jason's eyes, he wouldn't be as coachable as he is. Because Marla has always allowed me to have so much say, Jason followed that lead and allows me to coach him. That's kind of the magic of how the triangle works." Ade said they all joke that "Jason was a terror when he was little. I mean a crazy monster with so much energy that he didn't know what to do with it and obviously skating gave him a great outlet." Jason remembers only that Ade "did the most incredible job." "What really calmed me down was how she taught me to deal with nerves and how to compete by figuring out why I was so nervous," he said. "I learned how to calm that and to really tame that beast inside of me. It turned me from a rowdy, crazy kid to dealing with it, and it really changed me mentally." From the Browns' perspective, it was pretty simple. "My kid was happy to go to the ice rink and he loved his coach and we thought she was a quality person," Marla said. "That was really it for a lot of years." Rival coaches urged the Browns to leave Ade. The same people urged Ade to not get too close to the families or the kids. I'd rather be called a second mom than the greatest jump technician in the figure skating world. I would much, much rather own that title because that means I'm actually leaving a legacy with people, something they'll carry forward for the rest of their lives. "I still hear that all the time: 'Oh, I don't talk to parents,' " Ade said. "There's this arrogance or an entitlement somehow from the coach that they don't need to talk to the family and I think to myself, 'That's the craziest thing I've ever heard. You're putting your child's life in my hands and you're trusting me to do the best job I can. The least I can do is give you the kind of feedback that you want.' "
Still, the sport's inherent push-and-pull could have easily yanked the Browns and Ade apart, they all agree. "As Jason became better and we thought he potentially had a future in the sport, we got a lot of pressure for us to leave Kori," Marla said. "People said, 'She was great in the beginning but you need someone to take him all the way. She's taken him as far as she can.' We definitely got a lot of that kind of pressure. . .
"I remember when he was still little, maybe 9, another coach came to us and said, 'I can make him a champion.' I looked at my husband and said, 'He's crazy. He wants Jason to move away.' That just wasn't in the cards for us.' 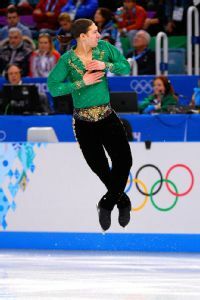 "
The argument resurfaced as Jason struggled to master the triple axel through high school. Even Ade joined the chorus saying that the Browns should think about having Jason live in a more competitive environment. But in the end, Marla said, "Kori respected our decision." In turn, Brown said, Ade was always open to supplemental coaching, and her coaching knowledge grew along with her experience. "We never thought about leaving Kori," Marla said. "Did some other coach have the secret technique? Did they have a better eye for mistakes he was making? My husband and I would talk and say maybe it's true, maybe it isn't, but at the end of the day our child could not have been happier or more motivated with anyone else. "It was like Bela Karolyi and Mary Lou Retton. You believed they were a team and that's what I believed about Jason and Kori. They were on this journey together." Jason Brown credits Abe and his mother for his on-ice success. Indeed, Ade wanted to be as involved in the development process as she could. "I took it very seriously that if a child didn't know how to shake hands properly, I was going to be the one to teach them to have a firm handshake and look people in the eye," she said. It's both a heavy and heady obligation, she said, and one that ultimately shaped her as a coach. "If that makes me a second mom, I'm so proud to be a second mom. I'd rather be called a second mom than the greatest jump technician in the figure skating world. I would much, much rather own that title because that means I'm actually leaving a legacy with people, something they'll carry forward for the rest of their lives. The axel is secondary to all the things the whole journey can offer." Jason did end up moving from the Chicago area to Colorado, but it wasn't until spring 2013, after he graduated from Highland Park High School. And it was with Kori, her husband, Sean Johnston, and their children Athena, now 4, and Kaia, who celebrated her first birthday in April. "The most important thing to my mom and dad was that they were going to raise me until I graduated from high school," Jason said. "They wanted me to be with my parents in their house and I really respect that and I couldn't be more grounded or feel more prepared to live on my own now." Ade and the Browns may have arrived at the same conclusion together, but what was also evident was that they had been in agreement all along. And for Jason, all he saw were two women who unselfishly thought only of his best interests. "For my mom, seeing her kid so happy was always the most important thing to her. She let me spend summers [training] with Kori, she trusted her and Kori never overstepped her boundaries, by any means. "It's why I'm still so close to my mom. We can talk about everything. I couldn't have asked for a better situation all the way around."